Collective decision systems such as markets, polls, and votes are central to the way society organizes and allocates resources. The use of these and related modern mechanisms is on the rise, finding applications in areas as diverse as technological and economic forecasting, crowdsourcing, product rating, public policy design, and mapping natural disasters. Hence, providing a sound understanding of and useful design guidelines for these systems is of paramount importance. In recent years, though, science has offered contrasting findings. For instance, studies have shown that social interaction can either promote the “wisdom of the crowd” and significantly benefit group and individual judgements or, conversely, lead to the “madness of the mob” by inducing social bias, herding, and group-think. Most of these studies assume, explicitly or implicitly, static social structures and stable environments, offering only a partial view on human collective intelligence. However, the social networks we live in are neither static nor random but emerge from endogenous social processes and gradual evolution. Therefore, we need to understand the dynamic relationship between “networks” and individuals, where networks emerge from the interactions of individuals over time, who are in turn shaped by the emergent networks they constitute. 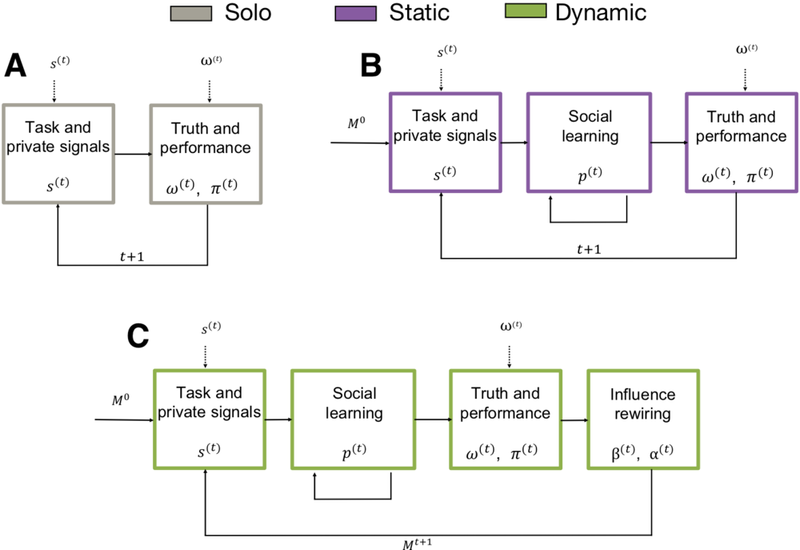 The present work overcomes common limitations of prior studies by considering adaptive social influence networks where individuals can actively choose and rewire their social connections. This narrows the gap to real-world social contexts, and places collective adaptive mechanisms on spotlight. We report on a set of human experiments involving 719 participants, and show that groups connected by dynamic networks can adapt to biased and non-stationary information environments, significantly improving both individual and collective judgements. We provide the surprising result that collective performance of these groups can far surpass that of their best individual, and that even the best individual’s judgment is substantially benefited from group engagement. We refer to this adaptive wisdom of the crowd process as the "wisdom of the network. Panel (A) depicts the Solo condition (i.e., no social information) where participants make independent estimates. This condition corresponds to the baseline wisdom of the crowd context. Panel (B) describes the Static network condition (i.e., social learning) where participants engage in a stage of interactive social learning, where they are exposed to the estimates of a fixed set of peers in real time. Panel (C) describes the Dynamic network (i.e., selective social learning) condition that adds the possibility for participants to choose who to follow and be influenced by in the next round. These results are relevant because of: (1) the remarkable potential and widespread use of collective decision systems in society; and (2) the underestimated role of adaptive social influence, and its positive effects in refining beliefs at the individual and collective levels.